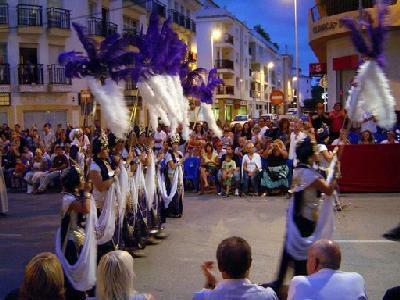 The Moors and Christians fiesta is the main annual festival in Moraira, and it takes place on the 3rd weekend in June. 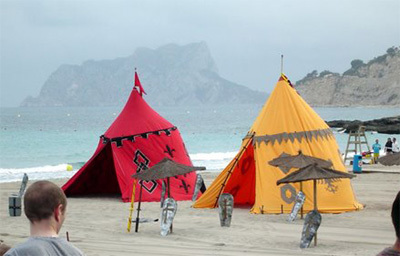 It is a re-enactment of the Moors' Islamic invasion of Spain which began approximately in the year 710, and the later Christian conquest of the Moors - misnamed "La Reconquista" (see potted history at foot of this page) - which was complete by about 1490. "La Reconquista" led to the Spanish Inquisition which was established in 1478 by the Catholic monarchs of the time in order to replace the medieval inquisition which had been under papal control. The purpose of the Inquisition was to force Jews, Muslims and, indeed, everyone to adopt, on pain of torture and death, the Christian religion. La Reconquista was complete by around 1490. 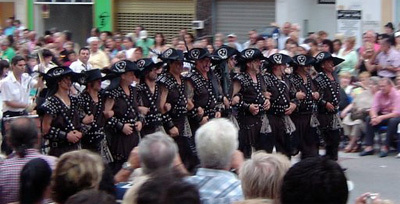 The Inquisition was not finally abolished until 1834.
their elaborate and colourful costumes and accessories. 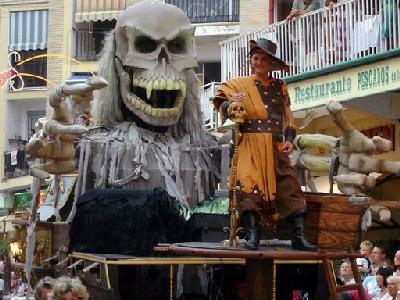 On the Saturday and through till Wednesday there are concerts and competitions in the town. 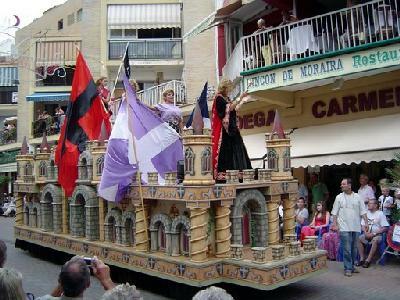 On the Thursday, there is the formal parade of the filaes and the official start of the fiestas with the raising of the Central Committee's flag and firing of blunderbusses at the castle. 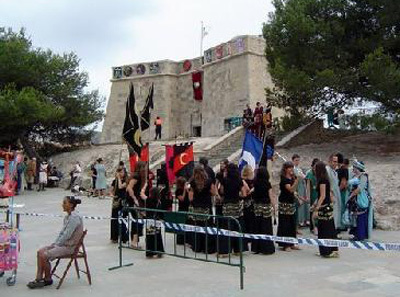 Also, on the castle promenade, we see the standard bearers of each filà along with the Christian and Moorish Ambassadors followed by the Presentation of Standards of each filà. Then everyone dances the night away. 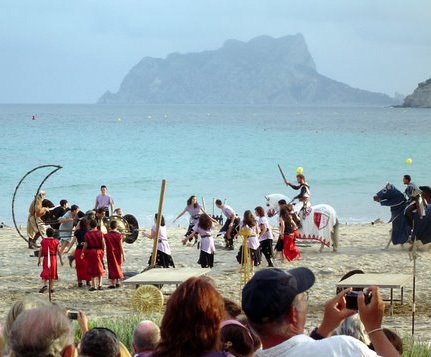 On the Friday there is more firing of the blunderbusses at the castle, informal parade of the filaes, and in the evening the spectacular arrival of the Moors from the sea. 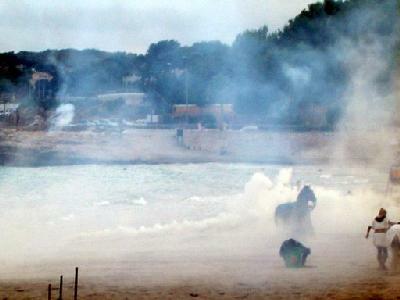 They disembark onto the beach and the battle commences ending with them taking the castle. 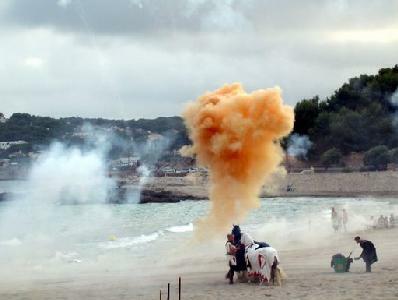 Early Saturday morning there is a general reveille with more firing of blunderbusses, more informal parades of the filaes, and in the evening another spectacular battle culminating in the Christians retaking the castle - plenty of guns and gunpowder once again! 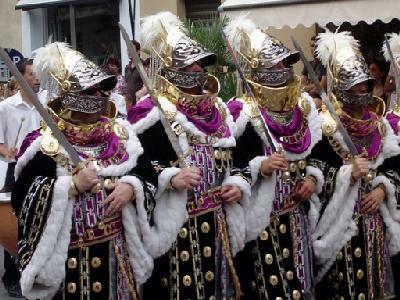 The week's fiesta ends on the Sunday with another wake-up with firing of blunderbusses, more informal parades and, in the evening ending around 11.00pm, the 4 hour formal parade of all the colourful participating Moors and Christians. 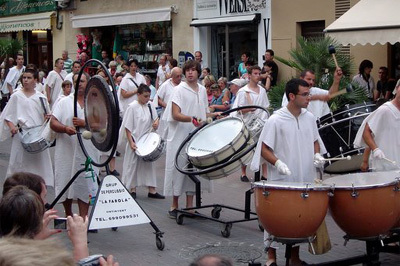 The bands belonging to each filà play music and bang drums appropriate to whether the filà is Moor or Christian. The night finally ends with a spectacular firework display. In 219 BC the first Roman troops invaded the Iberian Peninsula and created the province of Hispania which they used to supply the Roman Empire with food, olive oil, wine and metal. Early in the 5th century the Germanic tribes invaded and conquered parts of the peninsula, but it was the Visigoths (the second Germanic invasion) in the mid 7th century who took control of the entire peninsula. In AD 711 the first invading Moorish army (from North Africa) landed on Gibraltar and continued into the peninsula itself. The first Christian political entity was not established until some years later in the Kingdom of Asturias (in the north of the peninsula) and lasted from AD 718 until AD 925. 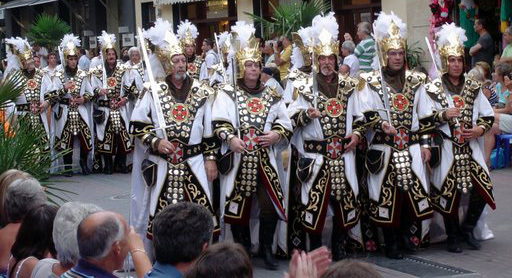 Previously this had been a pagan region until monks of the San Fructuoso order gradually settled in the Cantabrian mountains and began preaching the Christian doctrine to the locals. The 8th to the 15th centuries saw all except the north of the Iberian Peninsula ruled by the Moors - mainly Arabs and Berbers from North Africa who had also crossed over from North Africa. 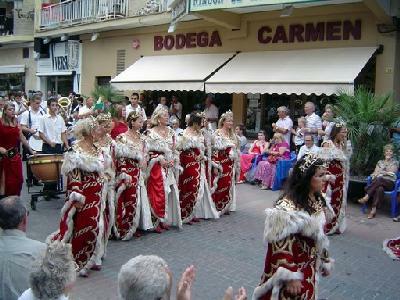 For large parts of its history, particularly under the Caliphate of Córdoba, al-Andalus (in the south of the peninsular and now known as Adalusia) was a beacon of learning, and the city of Córdoba became one of the leading cultural and economic centres not just in the Islamic world but in the entire Mediterranean Basin too. 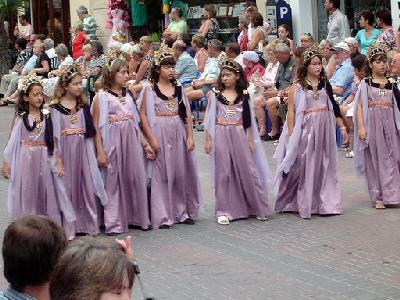 Although the Islamic conquest had been a military one and the Moors retained power and control, non-Muslims were given freedom to follow their own faiths and there was a great deal of educational, artistic, philosophical and cultural exchange between the various communities - particularly between the Muslims and the large Jewish Sephardic population. 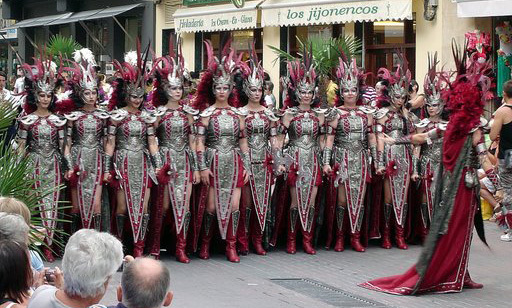 La Reconquista began soon after the Islamic conquest and lasted nearly 800 years. It was completed by about 1490. Since the Iberian Peninsula prior to the invasion of the Moors had not been a Christian political entity, it seems to the author of this potted history that the term "Reconquest" is a misnomer. It was a conquest, not a reconquest. The conquest of the Moors by the Christians, being of such great duration, is much more complex than this brief account can convey. The Christians were not a homogenous group and there were different sects amongst the Muslims too. Both Christian and Muslim rulers commonly became divided amongst themselves and fought each other. Alliances across faith lines were not unusual. The fighting along the Christian-Muslim frontier was punctuated by periods of prolonged peace and truces. Blurring matters even further were the mercenaries who simply fought for whoever paid most.